Kile Berg was born in 1939 in Redlands, California. He enlisted in the U.S. Air Force on April 11, 1958, and entered the Aviation Cadet Program of the Air Force on December 10, 1958, earning his commission and pilot wings at Greenville AFB, Mississippi, on March 18, 1960. After completing Gunnery School and F-100 Super Sabre Combat Crew Training, Lt Berg served as an F-100 and F-105 Thunderchief pilot with the 7th Tactical Fighter Squadron at Spangdahlem AB, West Germany, from March 1961 to March 1965, followed by service as an F-105 pilot with the 563rd Tactical Fighter Squadron at McConnell AFB, Kansas, from March to April 1965. Capt Berg then deployed to Southeast Asia with his unit, and was forced to eject over North Vietnam and was taken as a Prisoner of War on July 27, 1965. After spending 2,758 days in captivity, Maj Berg was released during Operation Homecoming on February 12, 1973. He was briefly hospitalized to recover from his injuries at March AFB, California, and then received an Air Force Institute of Technology assignment to the University of Washington, where he received his master's degree in Accounting in March 1976. 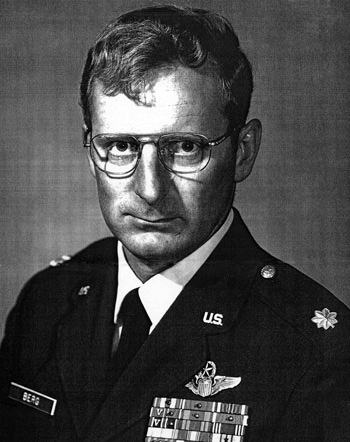 Col Berg's final assignment was as a C-141 Starlifter pilot and Assistant Operations Officer for the 4th Military Airlift Squadron of the 62nd Military Airlift Wing at McChord AFB, Washington, from March 1976 until he retired from the Air Force on June 1, 1978. For gallantry in connection with military operations against an opposing armed force as Pilot of an F-105 Thunderchief Fighter-Bomber of the 563d Tactical Fighter Squadron, in action over North Vietnam, on 27 July 1968. On that date, as a Flight Leader, Captain Berg participated in a strike against a heavily defended Surface-to-Air Missile site near Hanoi, Vietnam. This was the first attack by fighters against an operational SAM site in military history and the hazards involved cannot be overemphasized. Penetrating hostile defenses and heavy anti-aircraft fire on a low-level, high-speed run, Captain Berg courageously pressed the attack to score a direct hit on his assigned target. 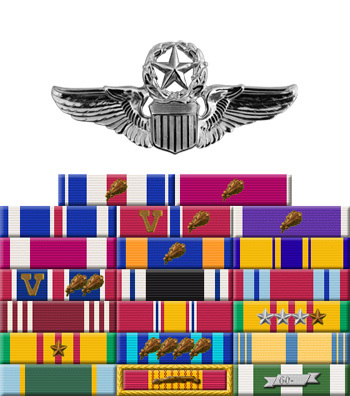 By his gallantry and devotion to duty, Captain Berg has reflected great credit upon himself and the United States Air Force.